Cat Chat With Caren And Cody: Cody Celebrates His 10th Gotcha Day With A Kitty Kick Stix™ Give-Away! Cody Celebrates His 10th Gotcha Day With A Kitty Kick Stix™ Give-Away! Disclosure from Cody: I received free product and a small payment for this review. 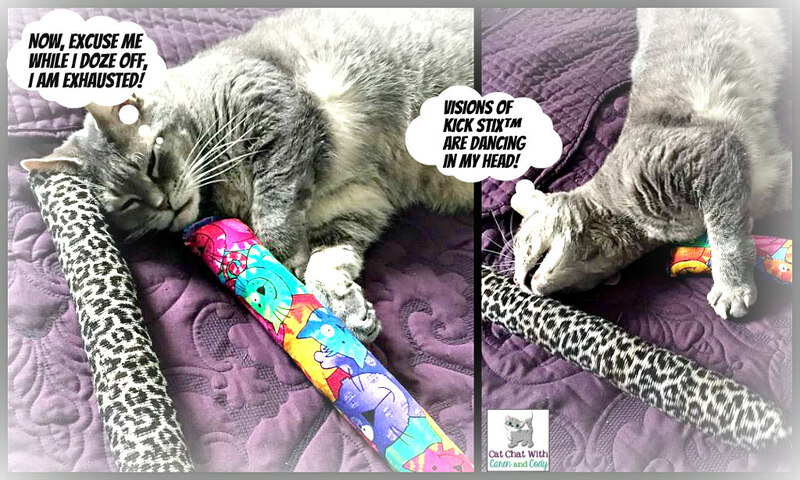 Kitty Kick Stix is not responsible for anything I meowed during this review, and receiving payment for this review in no way influenced us about this product that we already loved because we have reviewed it in the past! All the way back in 2012!! and again in 2013! 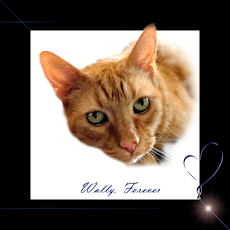 Hi my furiends!!! It's Cody and I am sooo happy you could join me today! Today is a most SPECIAL DAY!! 10 YEARS AGO TODAY I came to my furever home with my Mom and Dad. Lemme tell ya pals, those 10 years have FLOWN by! 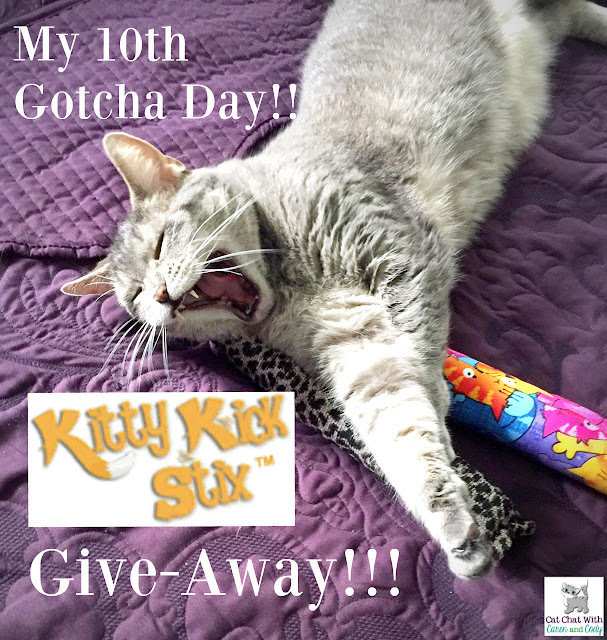 In honor of my 10th Gotcha Day I wanted to feature a product that I first featured way back in 2012, when Kitty Kick Stix, a family-owned business was first founded. 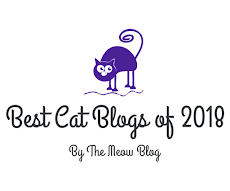 I also featured them in 2013 and have been enjoying my own Kitty Kick Stix for quite some time! Of ALL of my catnip toys, they remain a FAVORITE! Kitty Kick Stix has dedicated all of their time and effort to creating the softest, most durable, and "cat-nipiest" cat toy on the market!! 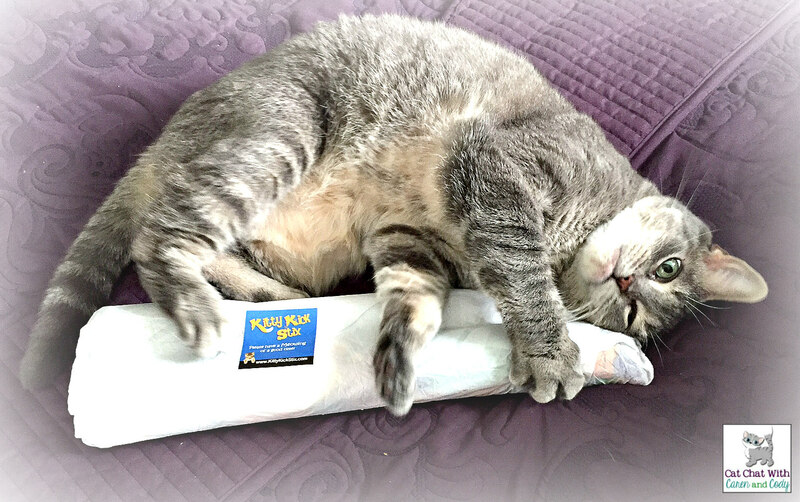 Each Kitty Kick Stix is hand made in the USA, within 72 hours from San Clemente, CA to ensure the freshest catnip possible. Another great thing about their toys? Each one that is purchased helps support a cat shelter! Don't be fooled by imitations!! to take the wrapping paper off, I had to get into mine RIGHT AWAY!! Kitties, I LOVE the soft cotton fabric, that is "clawtastically strong!! ", and it is layered with 100% Organic Catnip to give ME and YOUR KITTIES hours of enjoyment!!! Kitties since these are HANDMADE IN THE USA, you can choose your own fabric, and now there are THREE SIZES AVAILABLE! There is the ORIGINAL 15" long, 3" thick, there is 11" and even 6"!!! (Different packages are available too!!) Each is filled with 100% Organic catnip!!!! My Mom doesn't have ANY other catnip kickers for me, why? Because who needs them when you have the ORIGINAL Kitty Kick Stix? My favorite thing to do with them is to squeeze them, roll with them and I LOVE to "BUNNY-KICK" them!!!! I received the original "Happy Cat" toy (multi-colored), and I also received the NEW EXTRA STRENGTH toy, (Leopard Print, see video below), for aggressive cats like me that just "keep on kickin!!!" Starting in 2016, we have partnered with multiple rescue organizations to donate a percentage of each order to a rescue of your choice. It’s a scary fact that each year, approximately 2.7 million animals are euthanized (1.2 million dogs and 1.4 million cats) – (Source aspca.org). We want to help cats around the world find excitement and purpose, along with the facilities having enough financial help as possible to continue the service they provide. 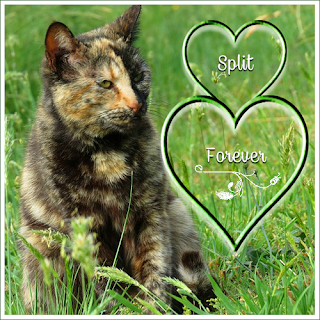 Of the cats entering shelters, approximately 37% are adopted, 41% are euthanized, and less than 5% of cats who came in as strays are returned to their owners. 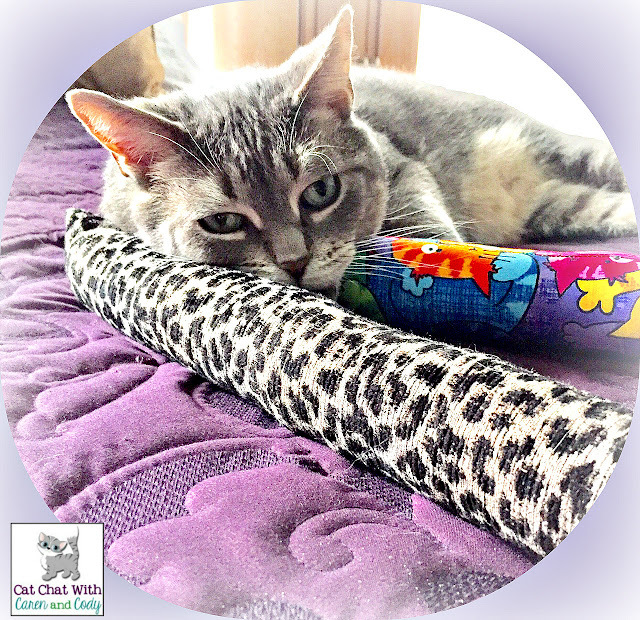 As part of the Kitty Kick Stix pledge, we will donate back to local rescues to help make a difference in a cat’s life! We think that is pretty darned special!!! Now, we have something special for you!!! A GIVE-AWAY!!!! We wish the give-away was an International Give-Away and we deeply apologize that we were unable to offer that, however, we DO HAVE A 10% OFF DISCOUNT CODE WITH NO EXPIRATION DATE!!! Just enter "CODY" at check-out and you will receive 10% off!!! NOW ON TO THE GIVE-AWAY!! TWO LUCKY KITTIES who reside in the U.S and CANADA have a chance to win their own Kitty Kick Stix!!! Entering is easy, just enter on the Rafflecopter below and good luck!!!! Thanks for visiting me on my 10th Gotcha Day and thank you Kick Stix™ for helping to make my special day even MORE special!!! Happy 10th Gotcha Day, Cody! What a furntastic way to celebrate, with so many kitty stix to choose from. You are too adorable in your video. We have to get our paws on one of those very soon! Enjoy! Happy gotcha day, Cody! We love those Kitty Kick Stix, and I know whoever wins your giveaway will be thrilled with theirs! Happy Gotcha Day Cody! 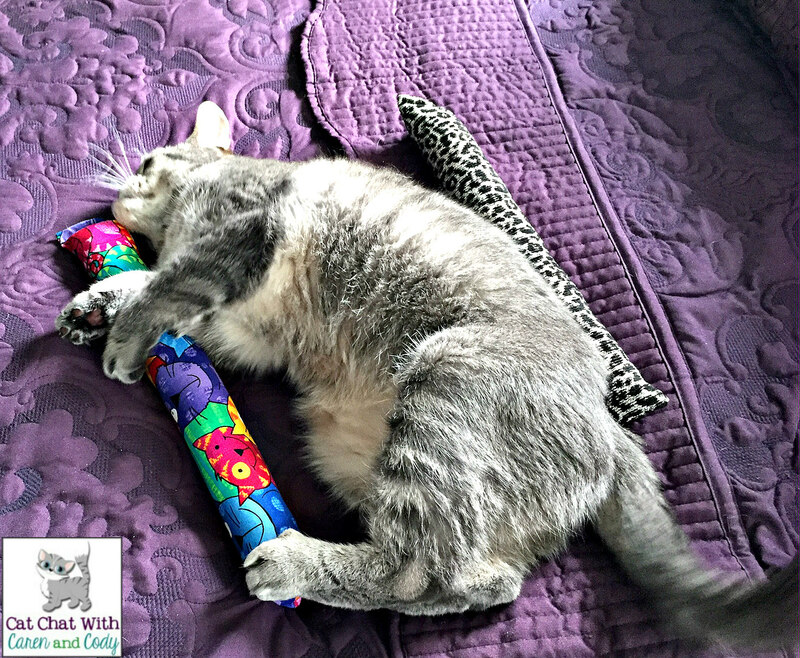 Love the pics of you enjoying your Kitty Kick Stix :) So cute! Those Kick Stix look tantalizing! Love how you had to have at it even before it came out of the wrappings, MOL!! 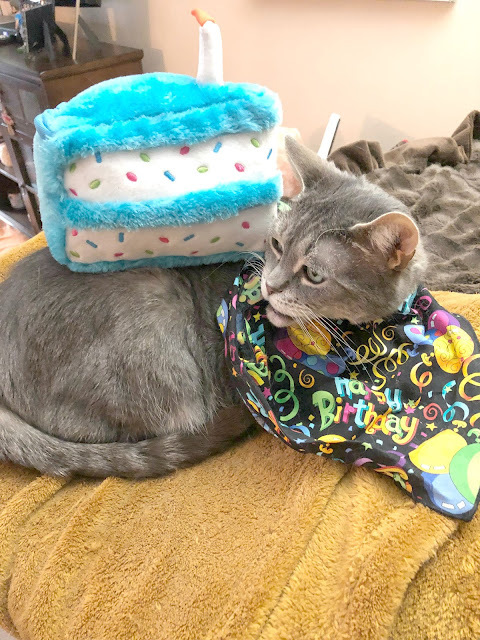 Oh, Cody, you are adorable in your very important roll of Birthday Boy Meets Kitty Stix!!! And a star, to boot in videos! Love that item. Unfortunately we don't live in Canada or the US but may we watch you play with it more often? Love from Loulou. Happy Gotcha Day Cody, we think Yin, Yang and Chimera would go nuts over a kick stix,Scylla loved hers, in fact she loved it so much she killed it. Happy Gotcha Day Cody. Have a fun filled day. Happy Gotcha Day, dear Cody. It's so nice of you to celebrate by sharing this cool kicker! Happy 10th Gotcha Day, Cody! Great review! 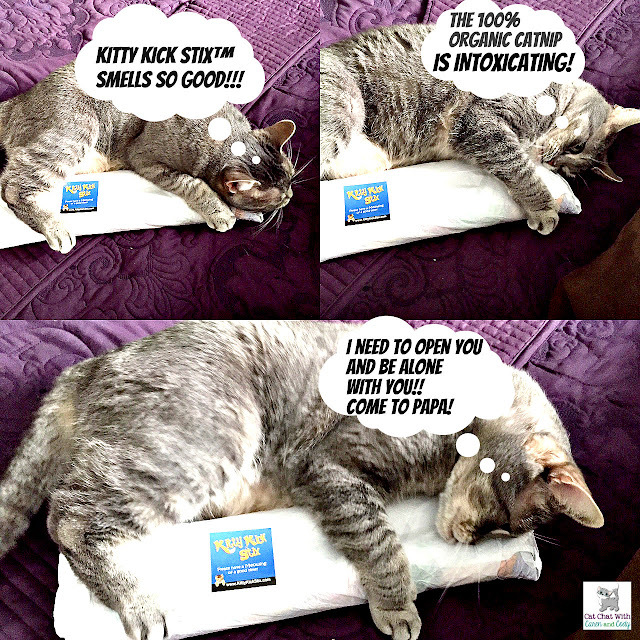 You make a great poster cat for that Kick Stix! Happy Gotcha Day Cody! Those Kitty kick Stix look like fun. Cody pal, Happy Gotcha Day from all of us! I hope your special day is super special, just like you! Happy Gotcha Day, Cody! Have a great day! Happy, Happy, Happy Gotcha Day, Cody! They are very special. It means someone lives you. Happy 10th Gotcha Day Cody! I hope you have a great and fun day. Happy Gotcha Day!!! Hope you get lots of treats and hugs! OMC, Cody these are the CUTEST pictures and videos of you! A very, very big Happy Gotcha Day to you! You are so lucky to have your parents and they are so lucky to have you. 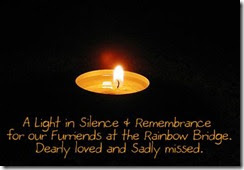 Love you, Cody! Happy Gotcha Day, Cody!! Even though I'm certainly tempted to, I'm not entering since I won one of these a few weeks ago. It's everything you say it is and I'm anything but a niphead. For some reason, I don't do bunnykicking but I love to rub against it. Enjoy your Gotcha Day cos you lucked out as did I. Happy 10th Gotcha Day, Cody! Bunny kicking is certainly a great way to celebrate! We love to bunny kick so we entered the giveaway and are crossing our paws! Thanks for the opportunity! Happy 10th Gotcha Day, Cody! Keep the party going! Happy Gotcha Day, Cody. Looks like it will be a fun one. 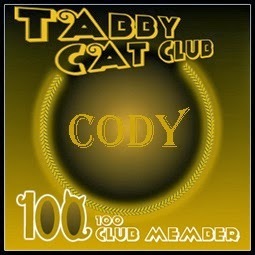 CONCATULATIONS Cody! What do the humans have planned fur your special day Gotcha Day? I'm so happy fur you! Aren't kicker toys the greatest?! 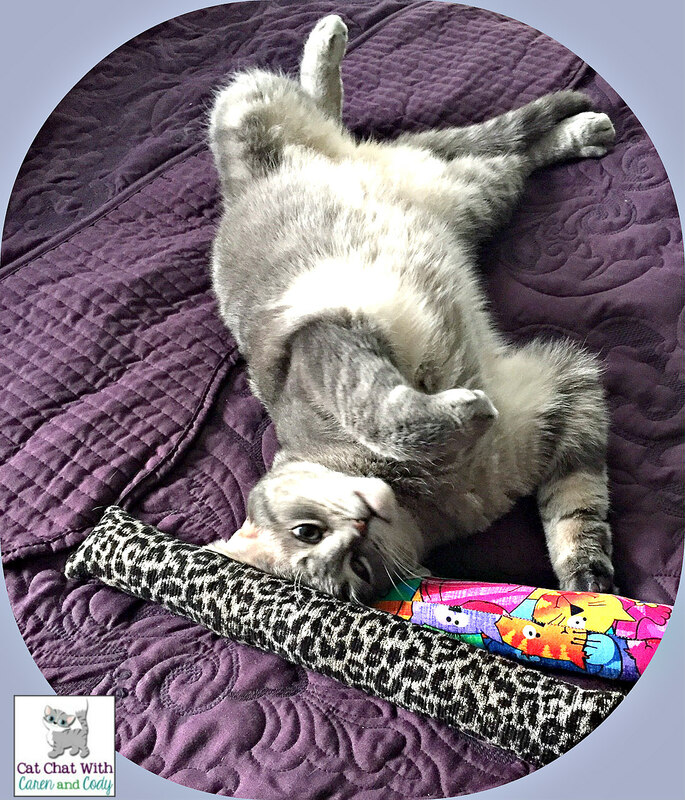 I bunny kick mine & use it fur a pillow & lick at it to get at the nip! WOW Cody! Happy TENTH Gotcha Day! Ten wonderful years of being pampered and spoiled and loved - what's better than that? Ten more at least I say......I think celebrating with a Catnippy Kick Stick is a great way to celebrate.......sending you hugs! Happy Happy Gotcha Day, sweet Cody!! Happy gotcha day, Cody! You're so cute in your first video just rubbing on the tissue paper. That means it has prime nip! I'm happy that you got to have so much fun celebrating your special day! Happy, Happy, Gotcha Day, Cody!!! Happy belated Gotcha Day! We do have a lot of catnip, but we don't care for it, hehe. So in a way it still does its' job because it's so entertaining to see Mom struggling with her nerves. Cody, Happy Belated Gotcha Day you handsome boy you! Your mommy got lucky to get YOU! You found a wonderful home. Your kick sticks look fun. I think that we need one. Hmm, we thought we commented here already, but it appears not! Happy Gotcha Day, Cody! We love you lots, and hope you're having a great weekend-long celebration of YOU! Happy (belated) Gotcha Day!!!! We hope it was pawsome! Ours are actually in the mail! I'm excited to try it out with our little ones! Cuddles abd hugs on your Gotcha Day, Cody! I'm late to the party, but Happy Belated Gotcha Day, Cody!! Happy Gotcha Day, Cody! You are such a pawsome guy. It has been fun watching your adventures over the last few years. I hope that there are many more!